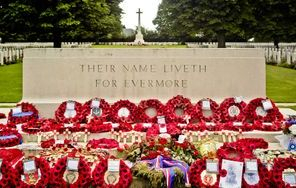 Bayeux War Cemetery and Memorial (photo) - Considered the largest WWII Commonwealth cemetery in France, Bayeux War Cemetery contains 4,144 Commonwealth burials, 338 of them unidentified. Just opposite the cemetery stands the Memorial which bears the names of more than 1,800 men of the Commonwealth land forces who died in the early stages of Overlord and have no known grave. Green Howards Memorial (Crepon) - Unveiled by His Majesty Harold V, King of Norway and Colonel-in Chief of the Green Howards, the memorial commemorates the men of 6th and 7th Battalion of the Green Howards who gave their lives for freedom during the Normandy Campaign. The monument is also about CSM Stanley Hollis and the D-Day actions which earned him the highest British military distinction - Victoria Cross. He was the only man to be awarded one on D-Day! Asnelles - The mission of taking Le Hamel ("Gold Beach" - "Jig Sector") was assigned to 231st British Infantry Brigade. 1st Hampshire were to take the brunt of the fire coming from the 88-mm gun placed in the blockhouse located on this section of the beach. The Dorsets, landing further east, out of the range of fire from Le Hamel, had slightly fewer difficulties. This was the strip of beach on which the 8th Armored Brigade quickly opened three beach gaps enabling later waves to have a swift drive inland. Mulberry B, (Arromanches) - This was one of two artificial harbours designed by T5 branch of the Royal Engineers. Its components had been built in England but assembled in Normandy. Set-up right in the heart of the assault area, Arromanches harbour was a masterpiece of Engineering. The numbers show that the amazing work of the Royal Engineers allowed the Allies, during six month of intense activity, to land at Arromanches 25% of the stores, 20% of the personnel and 15% of the vehicles brought to Normandy in the whole course of the campaign.